We have had some bigger crafts the past few Thursdays and the next couple weeks will be bigger as we get ready for Easter so I thought we would do a simple Easter craft today. I found this cool website: “Artists Helping Children” an on this site found instructions for Handprint Lilies. 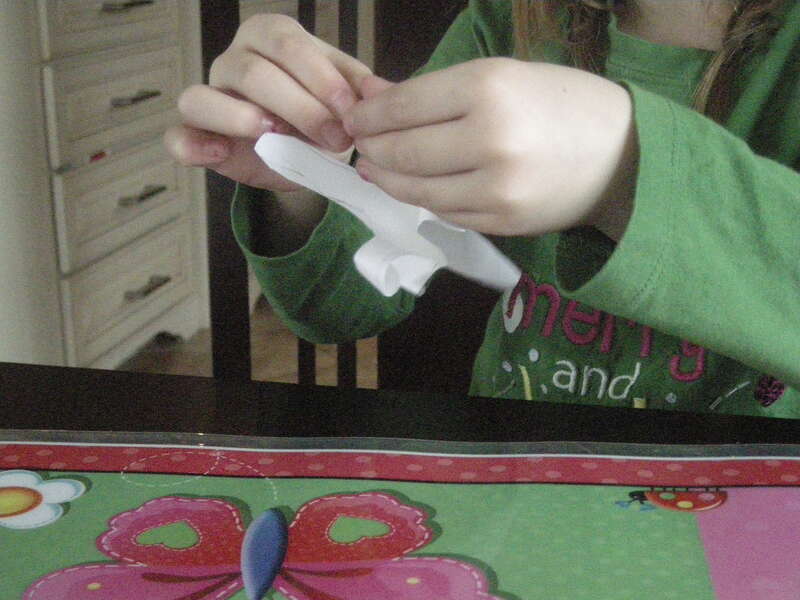 You don’t need many things for this craft: heavy weight white paper, pipecleaners, tape and scissors. It called for white construction paper but we didn’t have any so we used cover stock and it worked great. The best thing about this craft is that everyone could do parts of it, and needed minimal help from Mom (except Michale ofcourse). We stared by tracing our hands on the coverstock. Kaitlyn did her own and I traced Eileen’s and Michaels. Kaitlyn tried to cut out her own but cutting was the one step they all needed help with. We didn’t want any fingers/petals cut off. When cutting out the handprints make sure to leave a bit of a section by the wrist to give room for rolling into the cone. They then rolled their handprints into cones and taped them in place. Next was rolling down the fingers to open the petals. This step both of the girls were able to do themselves. Kaitlyn actually seemed better than Mommy at this part. 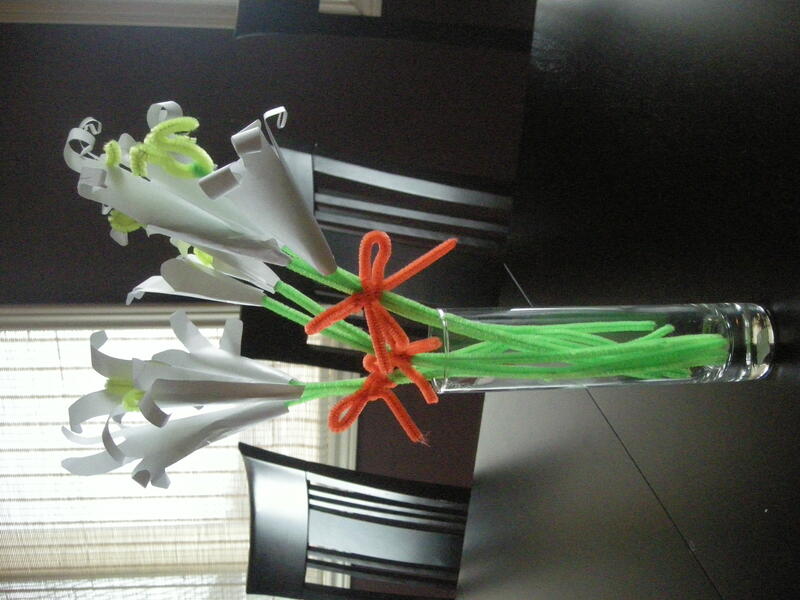 We added our yellow pipecleaner (cut into 3 equal parts) to the green stem and inserted them in our flowers. This part created a whole new discussion. Kaitlyn wanted to leave hers just as it was to use it as a puppet. I convinced her that maybe we could finish these flowers and then next week we would make bunny pop-up puppets for Easter. 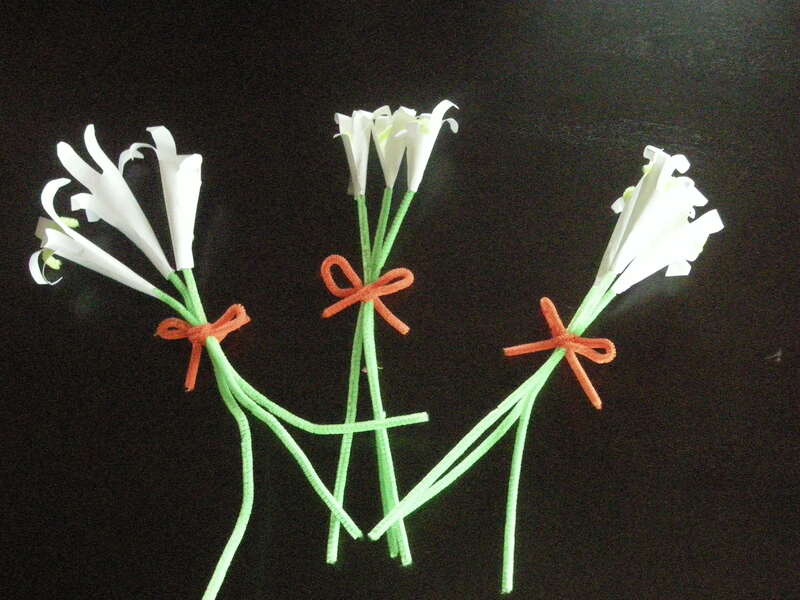 Each child made a bunch of 3 lilies and we tied a pipecleaner around as a ribbon. Everyone chose orange so they all look very similar. You can tell who’s is who’s by the size of the flowers (Michael’s are much smaller). A fun and easy craft for this week!